At AEE, our broad vision is a prosperous world that runs on secure, clean, affordable energy. In practical terms, for the electric power system, that means a grid that is more distributed, intelligent, flexible, and resilient, with high levels of distributed energy resources (DER) and large-scale renewable energy. Customers large and small will be more engaged with their energy use and will be “good citizens of the grid,” providing the utility with valuable services. Third-party product and service providers will be an integral part of this new ecosystem, whether working as contracted agents of utilities or as part of a competitive energy marketplace. Utilities, whether in vertically integrated or restructured states, will have new roles and responsibilities in managing this more complex grid and in providing essential services to customers and their designated third-party service providers. Arguably, a traditional utility cost-of-service regulatory model is not compatible with where technology is taking us. New York’s ambitious Reforming the Energy Vision proceeding, now five years old, continues to make progress on implementing a bold, comprehensive vision of the utility of the future, and will serve as an important platform on which to make Gov. Cuomo’s proposed Green New Deal a reality. But other states are also taking steps to update the utility business model for the 21st century. And there are as many ways to approach this problem as there are states in the union. Here is a sampling of what some states are doing. In Texas, the Public Utility Commission of Texas (PUCT) opened up a docket in 2018 on the use of “non-traditional technologies” by transmission and distribution utilities. Unlike Hawaii, where utilities are vertically integrated, Texas is highly restructured, and there are strict rules in place that limit the ability of regulated utilities to invest in DER, such as energy storage. The proceeding seeks to answer the basic question of how to get more beneficial use of DERs while fitting within the Lone Star State’s competitive market construct. After receiving comments, in early 2019, the PUCT kicked the question to the legislature, but intends to take up the topic again whether the legislature acts or not. So stay tuned, since how one of the largest and most competitive electricity markets in country handles this issue could provide an important model for other states to follow. Ohio has been exploring the range of issues associated with the changing utility business model in its PowerForward proceeding. After a series of workshops that concluded in 2018, the Public Utilities Commission of Ohio issued its PowerForward report and is currently in the process of convening a series of working groups to begin to implement some of the report’s recommendations. In Pennsylvania, the PUC has been exploring what it calls “alternative ratemaking” since 2015, when it held an en banc hearing on the subject. 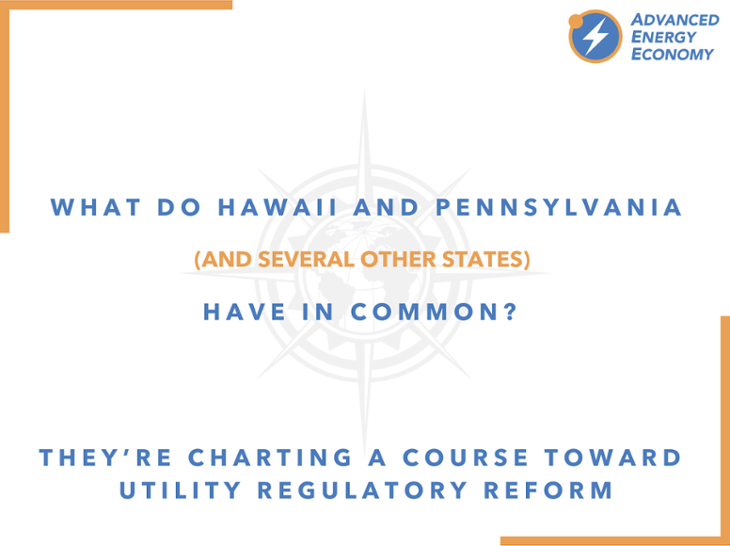 Although the process has been moving slowly, Act 58, which became law in 2018, clarified the ability of utilities to propose a wide range of alternative ratemaking methodologies and directed the PUC to establish the procedures by which utilities could do so. After a series of comment opportunities, we are still waiting on final orders from the PUC as the next step in this process but are hopeful that utilities will view Act 58 and the PUC’s interest in alternative ratemaking as an opportunity to propose innovative approaches to their business. Lastly, Illinois is moving to the final phases of a process to promulgate regulations on the regulatory treatment of cloud computing services by utilities. Compared to PBR, which looks at ways to incentivize utility outputs/outcomes, this proceeding is addressing new ways to treat inputs that are not capital investments. Cloud computing has become ubiquitous in most industries, but has yet to take hold in a significant way with utilities. Many new types of software that enable greater customer engagement, energy efficiency, and DER management are most efficiently deployed as cloud computing services. But due to the way that cost-of-service regulation provides earnings opportunities to utilities, a cloud computing solution will not benefit a utility financially as much as an on-premise IT system would. This creates a disincentive for utilities to invest in cloud computing solutions despite the potential benefits for customers. Thanks to the leadership of the Illinois Commerce Commission, we will soon have a model that improves the regulatory treatment of cloud-based IT solutions, which states could apply to cloud computing as well as other solutions that are offered as services in place of traditional utility capital investments. While it may be a cliché, there is no “one size fits all” approach to utility regulatory transformation. While it is possible to learn from what others have done, each state must build its own record and discover it for themselves. The deliberative and open regulatory process that has served us well for decades makes reform more of a marathon than a sprint, but thanks to leaders in states like these, the race to the future is on. AEE Institute has produced five case studies of utility business model reforms in action, in association with Rocky Mountain Institute and America’s Power Plan, along with a report, “Navigating Utility Business Model Reform: A Practical Guide to Regulatory Design,” all available for download below.